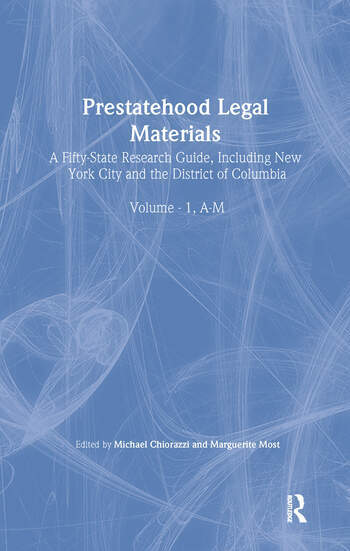 Prestatehood Legal Materials is your one-stop guide to the history and development of law in the U.S. and the change from territory to statehood. Unprecedented in its coverage of territorial government, this book identifies a wide range of available resources from each state to reveal the underlying legal principles that helped form the United States. In this unique publication, a state expert compiles each chapter using his or her own style, culminating in a diverse sourcebook that is interesting as well as informative. Prestatehood Legal Materials provides you with brief overviews of state histories from colonization to acceptance into the United States. In this book, you will see how foreign countries controlled the laws of these territories and how these states eventually broke away to govern themselves. The text also covers the legal issues with Native Americans, inter-state and the Mexico and Canadian borders, and the development of the executive, legislative, and judicial branches of state government. This guide focuses on materials that are readily available to historians, political scientists, legal scholars, and researchers. Resources that assist in locating not-so-easily accessible materials are also covered. Special sections focus on the legal resources of colonial New York City and Washington, DC—which is still technically in its prestatehood stage. Due to the enormity of this project, the editor of Prestatehood Legal Materials created a Web page where updates, corrections, additions and more will be posted. Volume I About the Editors Contributors Preface Chapter 1. Sources of Law in the Alabama Territory and the State of Alabama, 1798-1832: A Narrative Bibliography Paul M. Pruitt, Jr., and David I. Durham The Future Alabama in the Mississippi Territory, 1798-1817. The Alabama Territory, 1817-1819. Alabama’s 1819 Constitution and the Transition to Statehood. The State of Alabama, 1819-1832. Chapter 2. Alaska Prestatehood Legal Research Resources. Jessica Van Buren A Brief History. Creation of a New Judiciary. Conclusion. Primary Sources of Law. Secondary Sources. Chapter 3. Arizona Prestatehood Documents: Bibliography and Research Guide. Jacquelyn Gayle Kasper Introduction. Bibliographic Essay on Arizona History. Research Guides. Bibliography. Chapter 4. Arkansas Law Before Statehood. Glen-Peter Ahlers Sr. The Spanish and French Influences. American Soil. Historical Background. General Research Overview. Selected Bibliography. Chapter 6. Colorado Prestatehood Legal Resources: Sixteenth Century to 1876. Barbara Bintliff The Colorado Region Before the Territory of Colorado. Pre-Colorado Territory Extralegal Governments. Colorado Territory. Other Colorado Prestatehood Legal Materials. Chapter 7. A Guide to Connecticut Prestatehood Legal Research Janis Fusaris Introduction. Historical Background. Governing Documents. Legislative Sources.Judicial Sources. Executive Sources. Secondary Sources. Web Sites. Chapter 8. Colonial Delaware Legal Bibliography Eileen B. Cooper, David King, and Mary Jane Mallonee Historical Background. Legal Bibliography. Chapter 9. The Legal History of the District of Columbia Prior to Home Rule: A Bibliographic Essay. Luis M. Acosta Introduction. History and Governance of the District of Columbia. History of the Courts in the District of Columbia. Bibliography. Chapter 10. Tracking Down Legal Sources on Prestatehood Florida. Christopher A. Vallandingham The First Spanish Period, 1513-1763. The British Period, 1763-1783. The Second Spanish Period, 1783-1821.Territory of Florida, 1821-1845. The Disputes Over Land Grants. Conclusion. Chapter 11. Georgia Prestatehood Legal Research. Kristina L. Niedringhaus The Charter Period.Establishment of a Royal Colony. The Revolution. Bibliography. Chapter 12. Hawaii Prestatehood Legal Materials. Leina’ala Robinson Seeger Historical Summary. Monarchy (1795/1796 to January 17, 1893) Provisional Government (January 17, 1893 to July 3, 1894) Republic of Hawaii (July 4, 1894 to August 11, 1898/April 29, 1900) Territory of Hawaii (August 12, 1898/April 30, 1900 to August 20, 1959) Selected Federal Acts Relating to Statehood. State Constitution and Constitutional Convention. Selected Bibliography. Selected Web Sites. Chapter 13. Frontier Justice in the Territory of Idaho. Kristin M. Ford Introduction. Primary Sources. Secondary Sources. Chapter 14. Illinois Legal Research Before Statehood in 1818: A Bibliographical Guide Judith Gaskell Introduction. The Illinois Country Under the French from 1673 to 1765. The Era of English Rule from.